Data Protection on Virtualized Storage: Don’t Forget the Metadata. Virtual servers and virtualized storage systems contain real data. This data needs to be managed and protected, just like the data sitting on physical servers—it needs to be accessible by the right people, its usage needs to be monitored, and the right people need to be involved to decide who gets access to it and what acceptable use is. Organizations no longer have to manually manage permissions to ensure that only the correct users have access to the right data and that their permission can be revoked when they no longer need them. The previously impossible is now possible by leveraging metadata, which makes the protection of data on your virtualized storage as easy as vmware makes it to spin up a virtual host. When it comes to identifying sensitive data and protecting access to it, a number of types of metadata are relevant: user and group information, permissions information, access activity, and sensitive content indicators. 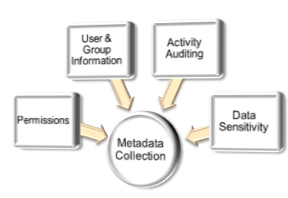 A key benefit to leveraging metadata for preventing data loss is that it can be used to focus and accelerate the data classification process. In many instances the ability to leverage metadata can speed up the process by up to 90%, providing a short list of where an organization's most sensitive data is, where it is most at risk, who has access to it and who shouldn't. Key questions that can be answered with the intelligent use of metadata include, who owns this data? Who has access to this data? Who should have access to it? Who is using it? What data is no longer being used? Where is sensitive data over exposed, and how do I fix it? Software automation that uses this metadata can supply the answers to these questions, route them and make them available to the newly found data owners and IT so that the right people in the organization can make informed data governance decisions. This post just touches the surface of this important issue, but you can learn more about how to leverage metadata technology at the January 20 VMUG Winter Warmer Event at Gillette Stadium in Foxborough. Daymark and Varonis will be discussing this topic at 2:00pm RED LEVEL, Room 20. Hope to see you there!